A favorite memory of past South By Southwest festivals was seeing White Mystery play outside at seminal Austin punk venue Beerland. The duo of Miss Alex White on guitar/vocals and Francis Scott Key White on drums belted out their usual ragged-edged garage rock startling passers-by on Red River Street. Before long, a mob formed blocking traffic in all directions. It was like seeing local heroes make good, as the Chicago siblings have made Omaha a regular tour stop on their many national sojourns, like the one they’re currently on in support of their latest album, the blistering F.Y.M.S. that brings them to fabulous O’Leaver’s March 4. Taylor Swift “Shake It Off.” Fight me! The best part about being in a band is the open road ahead of you. It’s a very free feeling of independence. The worst part is the claustrophobia of being stuck in a vehicle all day, that sets in shortly thereafter. My favorite substance is ice cream. My least favorite is mushrooms. Omaha is an awesome city to play in the Midwest because everyone is very down-to-earth, loving, and yet wild-out rock’n’roll. I spun records after Farnham Fest and realized how much everyone appreciated the DJ set, which is a really good, validating feeling. Doing that again at O’Leavers this time around. 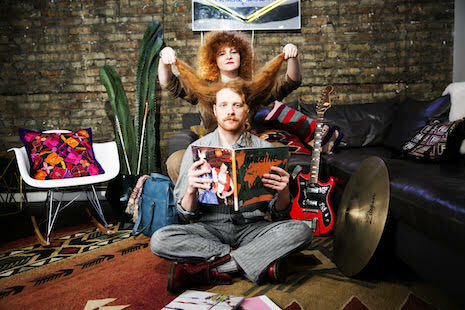 Beyond that, White Mystery shows in New York are always sold out, bonkers affairs. I also love playing Stockholm, Sweden, because it feels so geographically far away, yet super familiar. Angers, France, was one of the worst gigs ever, because of what happened afterwards — we stayed in an absolutely pest-infested apartment above the ancient venue. A carpet of tens of thousands of cockroaches dispersed when the door opened! It’s hard to relax in that kind of environment. Yes, White Mystery has been full-time for eight years. It required a lot of saving while reinvesting income into growth opportunities, like self-released albums and merchandise. The first four years, we did not buy any new clothes, shoes or recreational items. We have toured in the same hatchback this whole time, which is great on gas, but a sacrifice in comfort. The best way to get ahead is to do what is right for you, versus what you think people expect you to do. Take calculated risks to advance your career. One profession I would like to attempt is cartoon animator! I would be a terrible veterinarian though, because I’m extremely allergic to most animals. Legends about our pals in Digital Leather, The Faint, Solid Dave Goldberg, and the Box Elders circulate worldwide. Love you all!